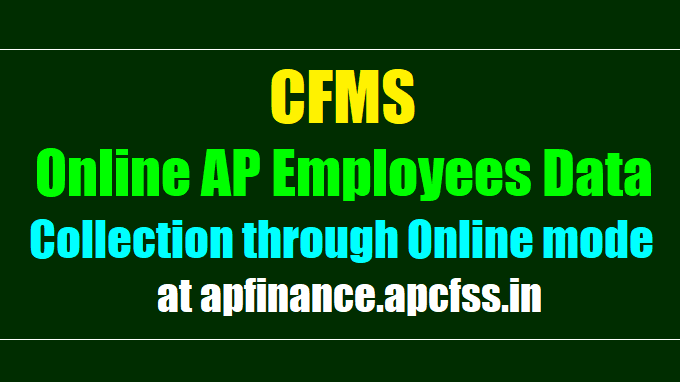 CFMS Online AP Employees Data Collection/Entry through Online mode at apfinance.apcfss.in, Online collection of AP Employees, Online AP Employees Data Uploading, Online AP Employees Details Uploading Instructions, Online AP Employees Data, AP Employees Data Online Application Form: G.O.Rt.No.2067 Dated: 26-10-2017 - Govt of AP - Public Services - Finance Department - Andhra Pradesh Centre for Finance Systems and Services (APCFSS) - Human Resources Management - Online Collection of Employees’ data through Web-based application for implementation of Comprehensive Financial Management System (CFMS) - Orders - Issued. ORDER: The Government of Andhra Pradesh is in the process of operationalizing Comprehensive Financial Management System (CFMS) on SAP platform. Finance Department has entered into a services agreement for this implementation of CFMS with SAP India Pvt. Ltd., who are working as a Systems Integrator for the project. 2. Comprehensive Financial Management System (CFMS), which when fully implemented, will facilitate real time management of public finances and the HR management in the state and usher in automation of all processes like preparation of budget; release of funds; distribution of funds to the DDOs; incurring of expenditure; preparation and submission of bills by the DDOs; processing/audit of bills by the Treasuries; payment processes; collection of receipts (online/manual); preparation of accounts; maintenance of PD accounts; processing of leaves; management of HR events; maintenance of eService Book; maintenance of electronic data; etc. 3. Andhra Pradesh Centre for Financial Systems and Services (APCFSS), a Corporation under the Finance Department, is given the mandate to monitor the development, deployment and maintenance of the CFMS program and its related activities. As part of this, the Centre is responsible for process changes, data collection, training and change management activities related to the effective implementation of CFMS. 4. HRMS module of the CFMS program, is a critical component for the smooth operation of the SAP application. As part of this, establishing the state-wide structure of all the offices, identifying the cade strength of the each of these offices, defining the positions in the offices, identifying employees in the positions, identifying vacant positions, maintenance of office hierarchy and also the related hierarchies is an important requirement for the CFMS program. This HRMS module will automate all processes relating to the entire gamut of monetary and non-monetary entitlements of the employees; assessment of vacancies; recruitment authorization; preparation of panels for promotion; issues relating to pay fixations; revisions of Pay Scales; maintenance of electronic Service Registers; generation of Pay Rolls; timely payment of retirement benefits; sanction of leave; timely release of increments, etc. 5. Towards this, the Government has decided to collect the essential data in a mission mode through an online web-based application hosted on the Finance Department Portal. It has been decided to collect the data directly from all the offices to obviate delay in the matter. The data proposed to be collected now will help to build the organization structure of the entire Government and also to define the workflow within and without various functional units and linkages with the Treasuries/ PAOs etc. in order to ensure seamless work-flow and transfer of data and creation of a single source of truth. 6. In addition to the data of regular Government Employees, Government has decided to also collect the data relating to the grant-in-aid employees, ad-hoc personnel, honorary workers, work-charged staff, contingent employees, contract personnel, personnel hired on outsourcing basis through contractors, and all other miscellaneous functionaries who are directly or indirectly providing services to the government, in order to have a comprehensive database of all the human resources of the State, as this information is required for various analyses and for furnishing reports to the Finance Commission, C&AG, Legislative Assembly and Legislative Council and Parliament from time to time and to enable the government to formulate evidence-informed policy for efficient management of its human resources. Another important function that this data will enable is provisioning of systems and user access. 7. In this context, the Government hereby direct all the Heads of Departments and Heads of Offices of every unit/office (like an Engineering Office, Panchayat, Municipality, Elementary School, High School, Welfare Hostel, DHMO Office, Sub-Registrar Office, Sub-Treasury Office, Mandal Revenue Office, ZP CEO Office, Collector Office, Office of Director of Municipal Administration, Office of the Superintendent of Police at a District Level, Primary Health Care Center, Police Station etc.) in the state to furnish the data relating to all employees mentioned above through the web-based application by logging in to the Finance Department portal at “https://apfinance.apcfss.in” using the log-in ID/password (to be communicated to them separately). While doing so they also have to identify their level (like Hamlet/Village/Mandal/District/Regional/Zonal/State etc.). Detailed instructions are given in the annexure to this order. The relevant forms and the User Manual are also available in the website mentioned above. The helpline numbers are also indicated in the above mentioned website for the benefit of officers and employees. 8. The Application has three parts. The Part –I relates to metadata of the unit and the organizational hierarchy; Part –II relates to designations, posts, employee positions and the details of other categories of personnel engaged in the unit; and Part-III relates to mapping of services rendered by the department to the relevant heads of account for appropriate classification of the transactions. Part I and II relate to all offices/subordinate offices of the Government whereas the Part III has to be filled only by the Heads of the Department and is, therefore, not available to the Subordinate offices. 9. While the above application has already been released and many of the heads of departments and their offices/subordinate offices have already started to enter the date, the progress has been identified as not satisfactory. All the data has to be submitted by all the offices/subordinate offices of the Government on or before November 10th, 2017. All the heads of the Department and the heads of offices shall ensure that the required data-forms are filled in accurately and submit on or before this date, failing which the November payroll of the respective offices that have not completed the task will be impacted as this data shall be the source for the same. 10. The Administrative Departments and the Heads of the Department shall issue necessary instructions to the subordinate offices under their control to complete the data entry within the stipulated time. Heads of all Departments (HoDs) shall nominate a senior officer preferably the second in command to personally coordinate, supervise and monitor the entire data collection and data entry processes closely and ensure that correct data is entered and submitted as per the time schedule. In addition, the departments must identify a CFMS Nodal Officer for their department who will be responsible to liaise for all matters relating to the CFMS implementation and participate and support the program. These officers may be advised to liaise with identified Data Management Team of CFMS Unit, APCFSS, Ibrahimpatnam for any assistance in the matter. The names of these officers shall be communicated to the Chief Technology Officer, Finance Department for information and going forward coordination. 11. The District Collectors are requested to convene a meeting of the unit officers of all the departments in the district and review the progress and issue necessary instructions for timely completion of this required data entry on a mission mode. 12. The Director of Treasuries and Accounts (DTA), the Pay and Accounts Officer (PAO), and the Director of Work Accounts shall instruct their staff to liaise with the concerned departmental heads at the state, district, mandal and field levels to provide necessary logistic and operational support. They shall be instructed to furnish copies of this order to all the heads of office in their purview through the DDOs concerned under acknowledgment. They are instructed to liaise with the Data Management Team of CFMS Unit, APCFSS, Ibrahimpatnam. Additionally, they are required to provide a daily update on the progress to the Special Chief Secretary (FAC), Finance Department and ensure that this task is completed on a mission mode. 1. The heads of office have to login to the website https://apfinance.apcfss.in by using their log-in ID, which is communicated to them. 2. After the first login the user has to set a new password. The system has been designed to provide for change of password. They may remember the password and should not disclose to anyone to maintain integrity in data entry. The Head of the Office will be held responsible for any errors in data entry, if any passwords are misused or the data is entered without the knowledge of the Head of the Office. 3. After setting the new password, the HODs, HOOs and the DDOs should go through the user manual available on the website for a better understanding of all the fields of different screens intended to capture the data of different offices and categories of employees. 4. The user has to first enter the details of his own office and the details of the immediate subordinate offices, if any. It shall be noted that only the immediate subordinate offices shall be entered. For example, the HoD will give details only of the Regional or Zonal Offices, if they exist, but not the District and other subordinate offices. If there are no regional or zonal offices, then the HoD shall give only the details of the District offices but not offices below the district level. Similarly, the Regional/ Zonal Offices, have to enter only the details of the District offices but no other subordinate offices below district. The District offices shall enter the subordinate offices and the process shall continue till the last field unit. 5. On entry of the immediate subordinate office information, the concerned identified persons from that office like the Head of the Office, shall be notified with the User ID and Password for entering the data pertaining to that office. 7. The helpline numbers, were set up for the benefit of the officers and staff are provided in the website. 8. Issues that occur during the process of data entry, login or password issues, and general comments can also be addressed to cfmshrgoap@apcfss.in, in addition to calling helpline number, for resolution.